With America #2, writer Gabby Rivera, artist Joe Quinones, and artist Ming Doyle continue the sense of fun and excitement that marked the first issue. 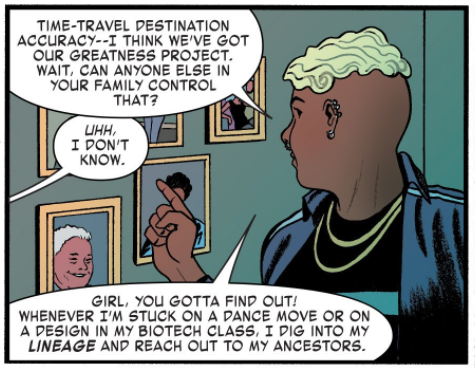 If the idea of a TED style talk given by Lunella Lafayette (aka the smartest person in the Marvel universe who just so happens to be a nine year old girl) doesn’t make you grin a tiny bit, you’re probably reading the wrong book. As a whole, the issue is a celebration of girl power, seen through a bright, fun lens. However, some of the problems from the first issue still remain: most notably the pacing. As soon as America returns home from World War II, she’s thrown right into a B-Plot involving prep school prospective students. We get one page of teasing out further plots and one page of America reacting to the past issue and a half, both of which are unfortunately ‘tell over show.’ America talks a LOT. 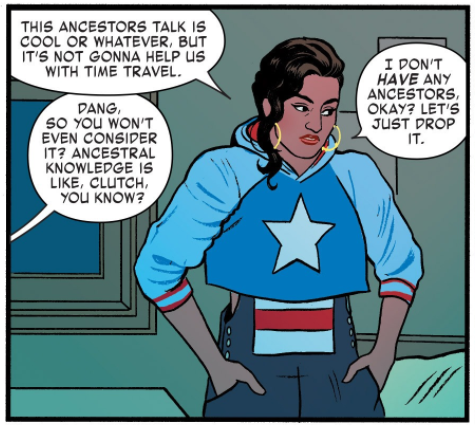 Since she’s the protagonist of the series, it’s understandable that she would have more dialogue and be comparatively more talkative than she was in Young Avengers—someone’s got to drive the plot, after all, and at least for Young Avengers, that someone wasn’t America. But the page where America reflects on her current state of life feels needlessly wordy. It feels like the sort of thing that America would tell a supporting cast member. Thankfully, Rivera, Quinones, and Doyle do a wonderful job building up America’s supporting cast, fleshing them out from their brief encounters in #1. That one page of teasing out further plots focuses on Professor Douglas, America’s ‘Intergalactic Revolutionaries and You’ professor. America becomes closer friends with X’Andria, the leader of one of the university’s sororities. Already, the characters provide a wonderful contrast with their ideas of family. Those little details that Quinones and Doyle add, such as X’Andria’s pictures on her wall, really help to sell the character and bring a new facet to her portrayal. Previous ArticleFrom The Record Crate: Sleater-Kinney — "Dig Me Out"